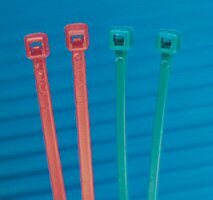 Halar Plastic Zip Ties | Flame Resistant Cable Ties | Cal Fasteners, Inc.
High flame resistance and low smoke density make these special Halar plastic zip ties ideal for plenum areas and other applications where smoke generation is a concern. Cal Fasteners offers Halar cable ties in 12 and 35-pound capacities to meet your needs. A number of unique features make these cable ties highly durable and easy to use. Special pawl and teeth designs, along with single-piece construction, give them superior tensile strength. Low insertion and pull through force makes installation easy. And tapered tails with finger grips allow for fast alignment and tightening in any application. Request a quote on Halar plastic cable ties for your project, or contact Cal Fasteners to learn more. *Halar is a trademark of Ausimont Chemical Company.